My husband LOVES flan. I’ve never understood why… every time I had flan in a restaurant it was lumpy and hard with a congealed cottage cheese texture – served in a bitter burnt-sugar tasting sauce. It reminded me of curdled milk… yuck! Since then, I’ve realized that is NOT how flan is supposed to be… and the poor flan examples I’ve had the misfortune of trying are what happens when you DON’T make flan correctly! Good flan is supposed to be creamy and smooth, with a soft silky texture. The sauce should be a rich golden caramel, with no hint of a burnt flavor at all. Once you have REAL flan, you will never consider even looking at gross overcooked flan ever again. 1. The less bubbles you start with in your custard batter, the less bubbles and “chunks” you will end up with in your cooked flan. Don’t overly agitate your mixture, and make sure you strain it through a sieve. 3. Insulation!!!! (So that the sides don’t cook faster than the center, ruining the texture.) Line the bottom of the baking pan with a thick kitchen towel, and use a hot water bath (NOT boiling water bath). And 4. Don’t overcook the caramel! 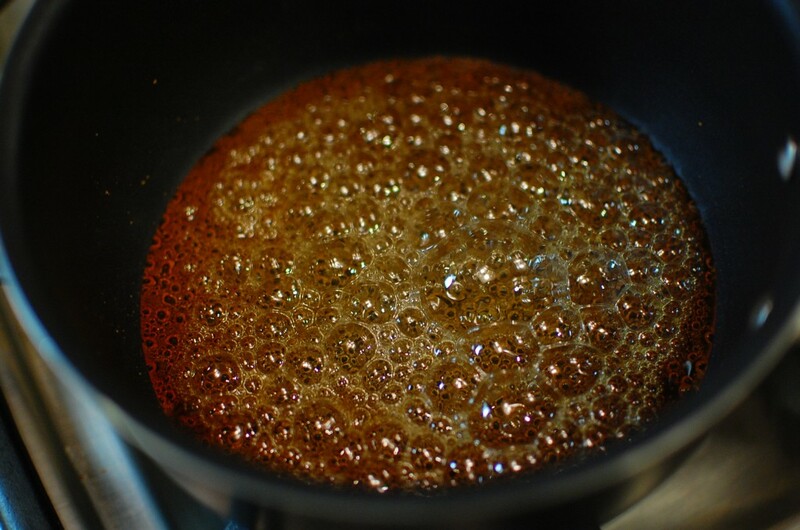 Caramel can go from perfect to burnt in less then 15 seconds, so babysit your cooking caramel, and do not leave the pot’s side! Also, remember that crystallization will occur if you don’t cook your caramel the right way – follow all the instructions exactly as written, lest your caramel seize! Don’t stir the caramel! 2. Cook the sugar mixture for about 5 minutes or so (maybe a few minutes longer if needed), swirling the pot very gently once every 30 seconds, until the mixture is a golden amber color. (The sugar can burn or seize pretty quickly, so don’t walk away from the pan! 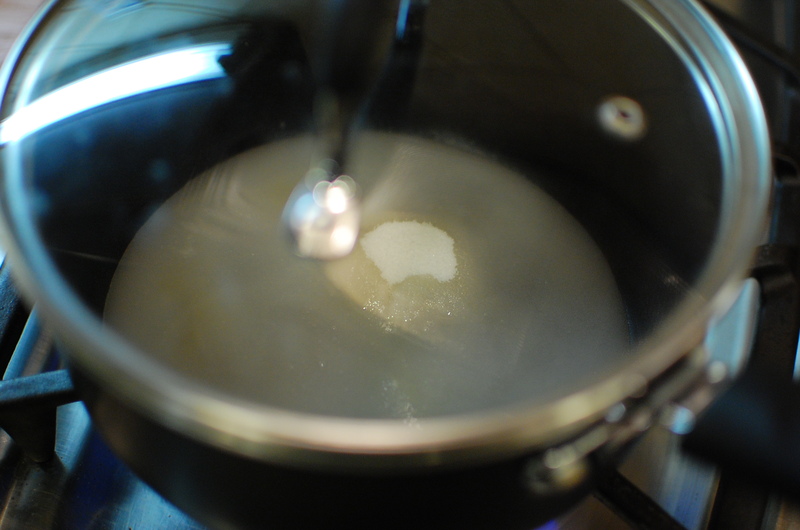 Once the sugar turns the correct color, turn the heat off immediately, and remove the pot from the stove.) Do not stir, do not add water, do not add more sugar, and do not swirl the pan too briskly. If your caramel seizes and turns into a jagged rocky mess of crystals, you will have to start over. Remove the pan from the heat and proceed to step 3 immediately – the caramel will continue to cook and darken in the pot, so do this as quickly as possible (but don’t burn yourself – the caramel will feel like molten hot lava should you spill on yourself!). 3. 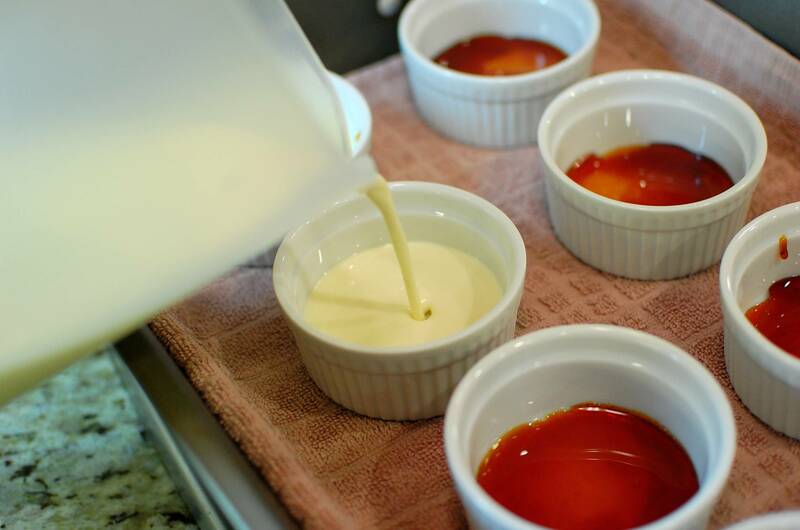 Quickly pour the hot caramel into the bottom of each ramekin. 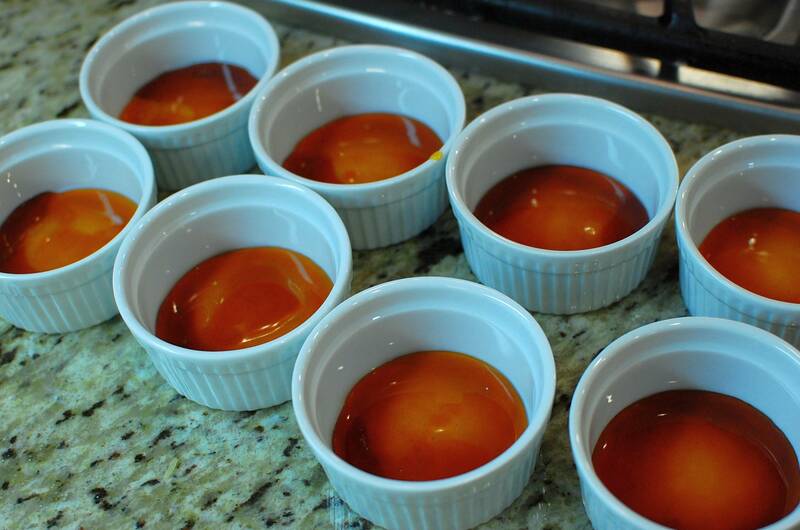 (The caramel will harden against the bottom of the ramekin almost immediately – this is normal, so don’t worry about it!) Tilt the ramekins slightly to ensure the caramel covers the entire bottom. 5. Strain the mixture through a sieve directly into a pitcher (for easy pouring in the next step). Straining the custard mixture will help remove any bits of egg chalaza and any remaining air bubbles (for a smoother flan texture). 11. To serve, run a knife or spatula around the edge to loosen the sides of the flan, then invert onto a dessert plate. Enjoy your perfectly cooked, smooth, flan! You can store the flan in the (plastic wrap covered) ramekins in your refrigerator for up to 5 days. whenever i make flan the caramel always go hard after cooling down how to prevent this? You can’t prevent this. The caramel is supposed to get hard. When you cook the flan over the caramel, and after storing in the refrigerator though… enough of the caramel will “melt” with the liquid in the flan and create a liquid caramel sauce, and give you the nice golden brown top. If you have a little bit of hardened caramel stuck in your ramekin, soak it in hot water to clean. The longer you store the flan in the refrigerator, the more the caramel will turn from hard to a syrupy sauce. I recommend making them a day ahead of time if possible. THAMK YOU SO MUCH! I TRIED IT AND IT WAS AMAZING, TOTALLY PERFECT! instead of sugar, can I use condensed milk? There are other recipes for flan that call for sweetened condensed milk – this recipe is not one of them. You would need to alter many of the ingredients and proportions if you wanted to make that substitution. It would be better to just find a different recipe calling for sweetened condensed milk and go with that one instead. Many of the techniques in this recipe should still help make your flan turn out well regardless of the recipe used. May I ask what means 3 c. half and half in custard ingredients? “Half and half” is a common dairy product sold in the United States. Literally, it is “half cream, half milk”. If you cannot find actual “half and half” where you live, then use instead 1 1/2 c. whole milk + 1 1/2 c. heavy cream. If you want the real deal, go to the people who really know how to do this right– the Latins–it is FLAN after all. Go look at a video that show how to make real flan using real latin ingredients which involves condensed millk. In my opinion, this recipe is a sad attempt at the real thing! Thanks SO MUCH for your incredibly helpful comment!!!! Here in the real world, most people realize there are many different ways to do something… especially when it comes to cooking. While I’m sure whatever recipe you use works well for YOU, a lot of people have trouble making a decent flan. Flan is, after all, a baked custard… something that must be cooked gently, as overcooking or problems with technique can cause sub par results. I never said that my way is the ONLY way to do this… but it works for me, and this is how **I** do it. The purpose of this FREE CONTENT blog is to educate people and help amateur home cooks learn how to do something. If you don’t like my blog or my recipes… feel free not to come to this website and use any of the recipes or educational posts that I do in my spare time, without pay! 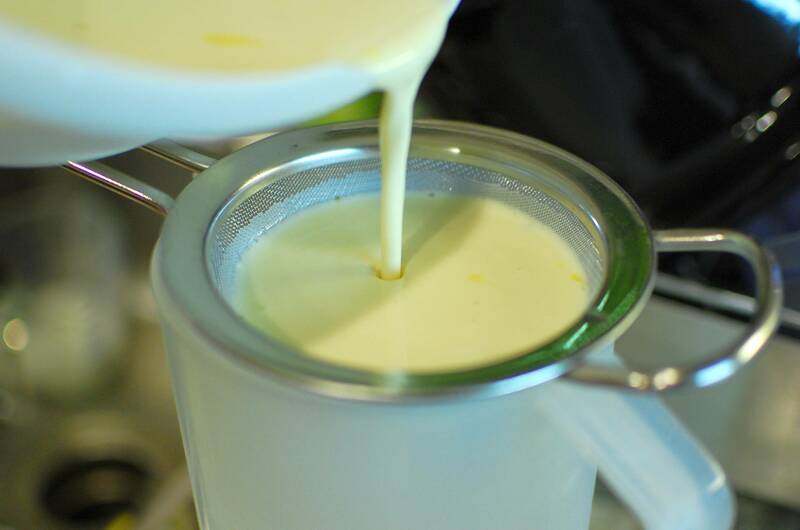 While you can make flan (or any other custard) with convenience products like sweetened condensed milk… you can make a simple custard using basic ingredients without the use of this particular processed product. It also might be helpful to remember that flan has been made for centuries — long before sweetened condensed milk was even imagined. Condensed milk is a staple in many (most?) Latin-American households, but is not nearly as common in Spain …. where flan originated. It’s true that what is now considered a traditional flan in Mexico or South/Central America is very likely to be made with sweetened condensed milk. 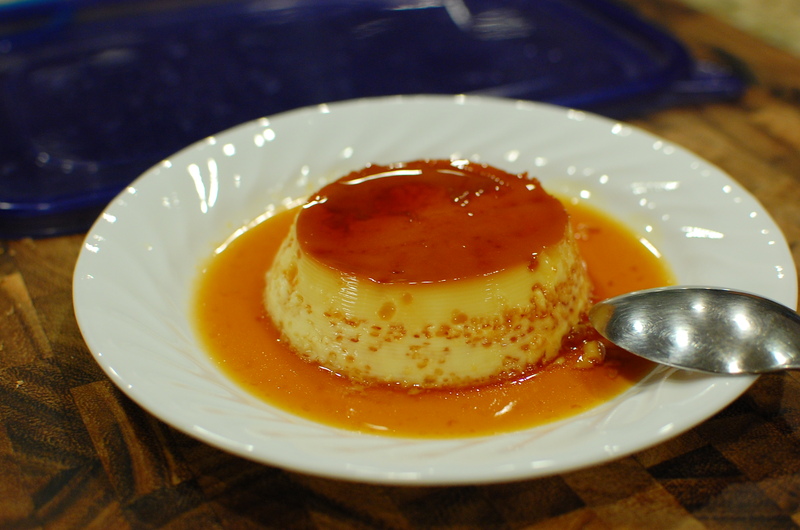 The flavor and texture of such a flan is quite distinct because of the condensed milk. A traditional Spanish flan, on the other hand, would be made with milk or cream (or a combination of them), eggs, sugar and some flavoring — they even sometimes use essence of lemon or orange blossoms to flavor it there, rather than vanilla, and all of those things create a very different kind of flan. Every abuela has her own favorite family recipe, and every hijito believes that their abuelita’s recipe is the perfect one! Thanks for the great recipe and explanation of the process. Extremely helpful. This reply made me absolutely SMILE! You go girl! Geez, it’s obvious those who have no life! wow Quellecatastrophe way to go on being a b**ch. you dont need to trash her recipe just because there are different ways to make flan. the fact you would judge her for this is just retarded. No you are wrong. There really is no such thing as “real” flan. I know many Mexican women who don’t like to use condensed milk. I actually think condensed milk bought in the store doesn’t give the flan as good of a taste. How do you think condensed milk is made? It’s milk with unrefined sugar. I am a latina and my Mexican family loves this recipe. This is an excellent recipe. It is very creamy, and ranks with the best. It is exactly what I would want from my flan from all the places in the world I have had flan. I am SO impressed by this entry asnd photos on flan. It is so clear and well explained. So now I understand three critical things: the towel , the sieve, and the knife insertion an inch from the center. Wow you are terrific. I am going to link to this site wherever i can because everyone should read this before making flan! You don’t cover your baking flans? I covered mine with foil tonight because i only have a convection oven (and it doesn’t have a no-fan option) and the fan was roughing up the surface of the flan. I would also stress to cooks to not pour the water higher than halfway up the ramekin sides, because of problems that can arise from lifting the heavy pan into the oven and tilting it such that water gets into the flan. Arggghhh, i had that happen tonight. Thx again for this great entry. I will spread the word far and near! When you say 2t water is 2 tabelespoon? Yes. 2 T. = 2 Tablespoons. The standard abbreviation for “Tablespoon” is a capital letter “T”. “Teaspoon” is abbreviated as lowercase “tsp”. Hi, I was just wondering if you were to blend the ingredients to create the flan, does that ruin the texture to it or create bubbles? Do you recommend to best do it by hand? Also by using sweetened condensed milk, will it make the flan more sweet or is there not much of a difference if created with sugar? Finally, some other sites chose brown sugar to make the caramel, does that make a difference too? Sorry for asking so much and hope to hear from you soon. I wouldn’t use a blender to mix the custard unless you have plenty of time to wait for the bubbles to subside. Any bubbles in the liquid custard will make your baked custard have a curdled texture (the small bubbles created will expand in volume when heated during the baking process). So it’s best to mix by hand, slowly stirring without creating too many bubbles. As far as using sweetened condensed milk vs. sugar… do not make any substitutions in this recipe. Some people like to make their flan with sweetened condensed milk, but the proportions of ingredients will be different. It’s just a different way of making flan. You can make the caramel out of brown sugar… however, I always use regular white (granulated) sugar, so I can’t give you any advice on that. It depends what kind of flavor you want in your caramel. Brown sugar has a hint of molasses flavor… so if you like that flavor, then you might enjoy the caramel made with brown sugar instead. However “brown sugar” is just white sugar + molasses, so it isn’t necessarily “better”, just different… and it definitely has a higher moisture content…. so you have to take that extra moisture into account when making the caramel. Hi.we do not get half and half here so instead of tht can I use fresh milk and for cream fresh cream??? Yes, if you cannot find “half and half”, use a 1:1 ratio of whole milk to cream. OMG!!! Thank you soooooo much for this! I had to submit something to cooking class soon and all the other website’s flan sucked! Yours was so great! I greatly appreciate this!!!!! I hop you have more of you great recipes that we will all be willing to learn!!!!! How long can you keep the Créme Caramel out of the fridge? Not too long. 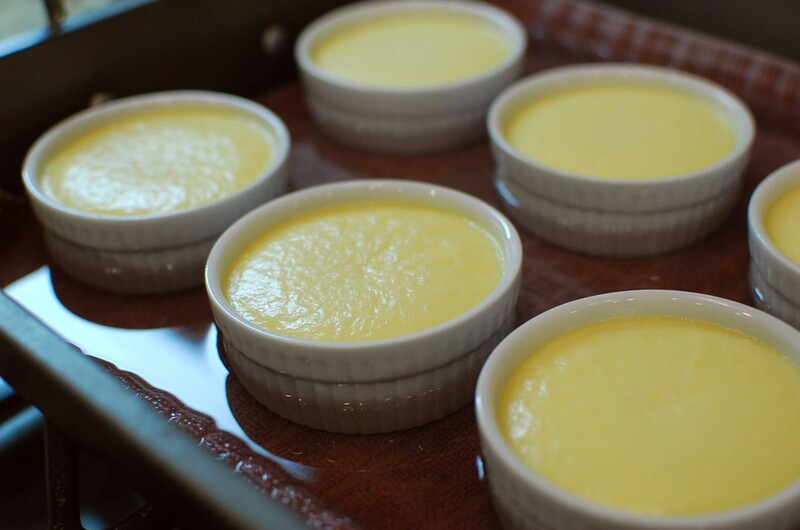 Once it cools down (after baking), it must be refrigerated because it is an egg based custard. I think if you use my instructions & recipe from start to finish (follow the instructions exactly), you will not end up with any bubbles. If you look at the recipe above, you will see that it does call for whole eggs. Also, please read the tips in the body of the text above the recipe. i know it ruined everything. Now it’s in the oven but it’s passed 30 mins and still not set. I am sad because i love this dessert and your recipe was easy to follow. Thank you and will try it again. Don’t wait for the custard to “set” in the oven… you need to take it out after 25-30 minutes, while it is still jiggly. Otherwise, it will definitely overcook and curdle! 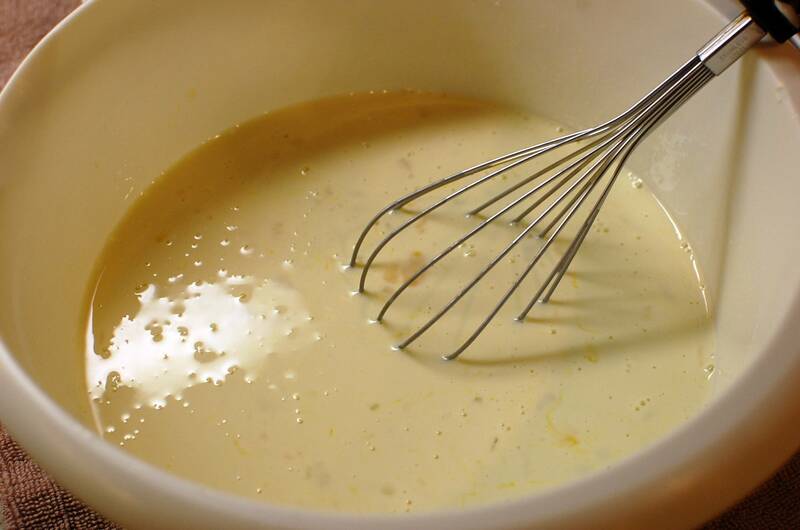 Remember, that the custard will continue to cook while it is cooling. You could try almond milk, but I don’t know if it has enough fat to give a creamy texture. Try it and see I guess? Coconut milk might work a little bit better… but I haven’t tried substituting the dairy in the recipe, so just a suggestion. If you use coconut milk, it will set after it is cold from the refrigerator. I’ve made flan with coconut milk (full fat) successfully. I forgot to mention that I heat the coconut milk slightly, just until the fat is melted. Why whole eggs? Not 3 egg yolks and 1 whole egg? If use it, it will be the same outcome? Why whole eggs? That’s my recipe, and that’s how I make it… that’s why! I’m not sure where you got “3 egg yolks and 1 whole egg” from… I didn’t mention that at all in the recipe. I wouldn’t use that substitution, though, because volume-wise, you will have much less egg to thicken your flan, and you will end up with more of a custard/pudding texture than a jiggly flan texture. Borj- The Yolk heavy flan you may be thinking of is closer to the Filipino flan and not what Mika is representing with this recipe/ Using more yolks is a creamier fattier alternative, but also is more touchy and easy to split when handling. Mika’s recipe is a great recipe for those looking for a more versatile Americanized flan. It is just as delicious, albeit slightly different. That’s what makes food great! Options! ***Also, for large quantity, this can be made in large or small aluminum loaf tins. Still cook in water-bath. Sprinkle a little sugar on the top for plastic wrapping to prevent the wrap from sticking. Keep the flan in the tins, wrap and refrigerate. As Mika has said and to add to it, sugar attracts moisture and so will liquify in the fridge even more when refrigerated overnight or longer. Will stay good for about 5 days in fridge. I wouldn’t hold it any longer for food safety, even with the high amount of sugar. Pull out tins as needed. Either loosen whole and plate or cut into cubes with strained caramel poured over. Thanks for your recipe and detailed post! Quick question – can I bake the flan in a larger dish – pie or cake pan – rather than individual ramekins? Will it just affect baking time, or do you think there are more ramifications? You could try baking in a larger dish… but the edges might end up more “done” before the center is fully set. I’ve never baked it that way – I prefer the smaller ramekins… so you might have to experiment with the baking time. I have been doing it in the 10 oz custard cups. It does take more time and the top of the the flan will start to turn a little brown because I have to leave it in for 40-50 minutes. If you experiement, make sure you don’t take the flan out of the oven until it is jello jiggly ( not unbaked cake mix jiggly). But, I use oval glass cups as well, so that might affect something or other depending on your cake pan, I do recommend a circle or square though. Good luck! Also, I don’t know if you make a water bath or not, but plan to. Happy baking! I need to make 100 for the church fundraising event. I am not sure how to mass produce this. could you please let me kow if I store the bake flan in the fridge longer than a day, would it make the flan harder. Also I notice when I flipped out the flan, I do have sugar stick on the dish. Can you tell me why and how to prevent it. I think I have mentioned previously that it is NORMAL to have sugar stuck to the dish when you flip it. Some of this is inevitable. If you store the flan (refrigerated) longer (like 1-2 days ahead of time) more of the sugar will dissolve, and you will have less sugar stuck to the dish. 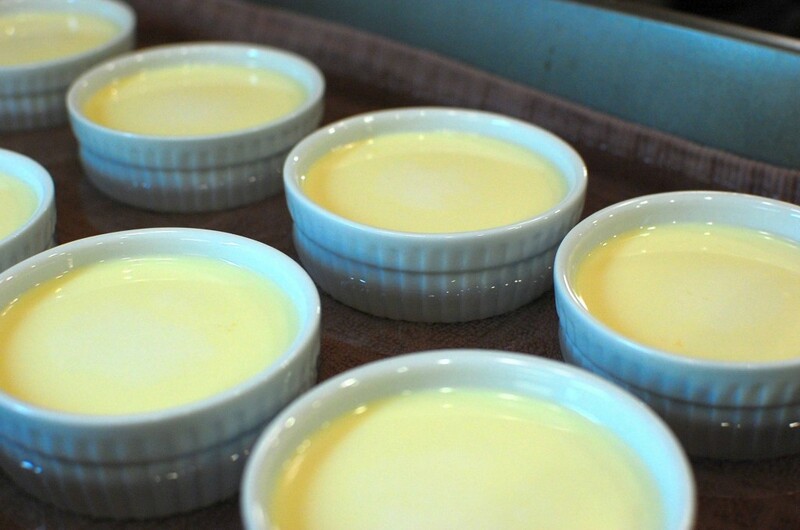 The flan will not become hard if you cover each ramekin with plastic wrap and refrigerate up to 2 days ahead of time. when you say 2tsp. vanilla, do you mean vanilla extract? Im planning to sell my Mom’s flan. Do u have an idea how to mass produce it? Can u help me with the costing if i plan to sell it? I mean aside from the ingredients, what else shld I include in the computation to properly account everything and come up with a price? I’m not a commercial baker – this is just a hobby for me. Other than pricing the ingredients, you might consider how much time your labor is worth, and what your costs are in terms of packaging, selling, marketing, etc. your product. Unfortunately, I can’t give you any advice about mass producing the flan – I only make single batches to serve to my family and friends. My suggestion would be to experiment to see what works best for you. I just read this recipe and am excited about trying it. I have been looking for a flan to put in my chocoflan cake that I’m experimenting with. The flan always comes out with a texture that is not palatable to me because I use sweetened condensed milk and evaporated milk, along with crème cheese as the different recipes recommend. However I’m wondering if I can use this recipe for the flan part and if it would work. Would it be to light and mix with the chocolate batter which rises to the top? What do you think? Thanks for your help, I can’t wait to try this my friends who love my cake just don’t get what I mean about texture. I’m not really sure. Are you planning on making the flan separate and using it as a layer between chocolate cake? I’m not sure how it would work out if you mixed it with chocolate cake batter… I don’t think it will separate out into chocolate cake and flan. It might be easier just to make a large flan and use that as a layer in between the actual cake. Im planning to make a bake leche flan. My question is, is it okay if i will use a small glass jar instead of llaneras or ramekin? and how long will it take to bake inside the oven if i use it? I’m not sure how long it will take. If the jars are a similar size as the ramekins, I would guess it would take about the same time. Have you read my blog post? All of those questions are answered above. 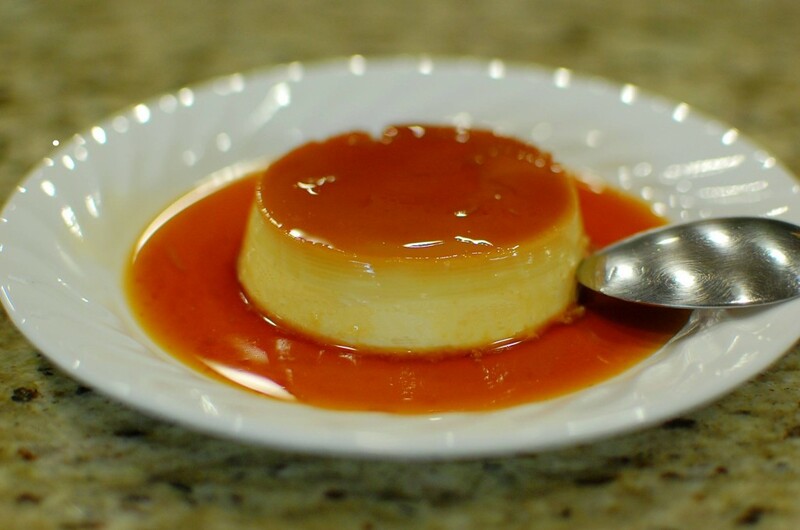 I typically hate Flan, I feel like its too sweet for my taste and I feel like more often then not Flan’s texture is more jello like than creamy. I’m interested in learning to make it because I have a boyfriend who LOVES Flan, so I will be experimenting with a couple different methods…yours being one of them. Recently I went to a local non-chain Mexican restaurant who is known for having great Flan… I was VERY hesitant because of my experience with it. To my surprise it was very creamy and not too sweet, I felt like it was perfect. Do you happen to know what might be different between the restaurants and what I have experienced growing up? do you think they might have made it with cream cheese instead…because it sure didn’t taste like it. Thanks for your input. Regarding the restaurants…I’m not really sure? I know different restaurants have different “quality control” standards… differing recipes too. I had the same experience as you… every time I had flan in the past at a restaurant, it was lumpy and gross… But I guess people get used to the way they make it, and if they are used to the lumpy texture, over time… maybe they don’t see it so much as a flaw, but part of how it “is supposed to be”? Although I would argue, that’s really NOT how it’s “supposed to be”. As far as making the flan, you can always adjust the sugar to your liking. I feel that my recipe is not overly sweet, so you might try it as-written first, then decrease the sugar slightly to your taste if you feel like it is still too sweet for you. I’ve never made flan with cream cheese before… to me, flan is more of a custard, and I worry that the use of cream cheese would make it too cheesecake-like, which I didn’t want. This is almost exactly how my mother used to make it. Can’t wait to give your recipe/techniques a try. First I need to go buy some ramekins. Thank you so much for your flan making tips! I’ve used a variety of combinations of milks, including coconut milk using your recommendations and every flan has turned out delicious and silky smooth. I just made one for a function and it was a hit. I had several people come up to me to say that they do not like flan, but mine was delicious. Thanks again! Hi:) I’m just wondering if I bake in a big round glass if it’s ok to not put it on top of a towel or add water..it’s going to be my first attempt . So you are planning on baking this in a glass pie pan instead of individual ramekins, without the insulation of the towel and the water bath? Sure, you could do that… but I’m not sure how this is going to turn out for you… it might end up being quite overcooked on the edges by the time the center has a chance to set. I think if it’s your first time, it will be easier to have the recipe turn out if you follow the instructions exactly as written. It will do fine in the glass dish. Still put into a hot water bath (no towel) I make it all the time this way and I am Cuban. There are SO MANY flan versions, each ethnicity has a little different version and guess what?? They are ALL wonderful and taste the same . I use a can of condensed milk and a can of evap milk, 2 whole eggs (yolk + white) and 4 yolks. I use whole milk and no half & half. Only difference I have ever found doing flan 10 different ways is the cooking time…and that is only a 15 min difference depending on whether I used whole milk, half & half or heavy cream in it. I check it a one hour with a cake poker and if it comes out clean, it is done and will keep cooking a bit once out of the oven. I have NEVER had any of the different recipes ‘curdle’ and I have been making it for 55 yrs. I do strain mine through a sieve because it removes a lot of air from the blended liquid and makes the flan smoother. There seems to be no ONE recipe for flan; it depends on where your ancestors learned to make it that is different. Enjoy! At the holidays when there will be lots of family I make my flan in a BUNDY pan…yes! I sure do and it comes out just as custardy and caramel drips down the sides. YUM! Mika,I am a 78 year old single male; I love flan, but I usually give in to the commercial (non egg) boxes because they are quick and are done on stove top. However, your recipe has inspired me, as have YOU. I read all of the comments and posts and your diligent responses. You must be an extraordinarily wonderful person because I have never before read such kind responses to what are sometimes mindless questions. You must have the patience of Job. Thank you for the recipe (which I will try tomorrow) and thank you for being YOU. I am going to subscribe to your blogs and it will be the first blog I have ever subscribed to. THANK YOU. How is my flan not cooking? Its liquid. Is your oven on? Lol. Did you use hot tap water? Did you use small ramekins? Keep in mind that the flan will continue to cook after you take it out of the oven – so you want it to still be a bit jiggly when you take it out. Do not wait for it to be solid or firm. I don’t really know. I have never made flan in a steamer. My concern would be that the plastic would melt when you add the molten hot caramel into it. Just want to ask what is the difference of.whole milk from fresh milk? Can i use fresh milk instead? “Whole milk” is a product commonly sold in the USA – it means “milk without the fat removed” (about 3.25% fat content). In contrast, here in the USA, we can buy “low fat” milk (either 1% or 2% milkfat), or “nonfat” milk (fat removed). For this recipe, I do not use milk, I use “half and half” – which is another USA product that means a liquid that is 50% cream, and 50% whole milk (1:1 ratio). We typically use “half and half” as coffee creamer, and in many dessert/dairy recipes. Ah, in a perfect world…all ramekins, pans, and ovens would be equal. But I don’t live in that perfect world. When it says follow the recipe EXACTLY, that means as far as the size and material the pans are made of. After baking 45 minutes my flans were still totally liquid. I checked the water temp with a thermometer and the water had not even reached the temp at which custard begins to set. My hot tap water is VERY hot, but I was using a glass baking pan, and glass does not transfer heat as well as metal. I did not have as much clearance around my ramekins as in the recipe and I think this all contributed to SLOW cooking. When my flans began to set up, they did so very unevenly meaning I was taking them out in stages as much as 20 minutes apart! I used the glass baking pan because I didn’t have a metal one large enough to bake all the flans at once in. Next time I will use a larger metal pan, give the flans lots of room and bake then in two sets rather than one. also, with the longer baking time, I needed to top off the hot water…which is not good because adding water at a diferent temp sort of throws the whole thing off yet again…so I had to mess with a thermometer to make sure I was adding water of aprox the same temp. All the info in this recipe and method is top notch, but now I know they need more room and a metal pan! I’m over 90 minutes into this and I still have two poking along in the oven. I wanted to share this in case someone else ran into these issues, so they know they are not alone! I was wondering, do I heat the half and half up? Most recipes for creme caramel say to heat up the milk/cream, but this doesn’t. Is that true, I should just mix the cold milk with the other ingredients? Also can I use whole milk instead of half-and-half? Thanks! No, you do not need to heat up the half and half. Use it at room temperature. Also, I would suggest that you do not substitute the half and half for whole milk. The reason why, is that half and half has a higher fat content and will create a creamier and richer flan, whereas straight milk will not be quite as creamy. If you can’t find half and half, then you want to use a 1:1 mixture of milk:cream, as that is (literally) what “half and half” stands for – half milk and half cream. American “half and half” is 50% whole milk, and 50% cream. Cream is a natural dairy product, just like milk. When a cow is milked, the liquid separates: the fatty layer (which is less dense) rises to the top – this is “cream”, the lower fat layer (more dense) is on the bottom – this is “milk”. Most stores sell different varieties of liquid cream – some higher fat (good for whipping), some lighter fat (for use in coffee, soups, etc.). Use a lighter fat cream to mix with milk to make half and half. I’m not sure? I prefer to make this in individual ramekins because the smaller the dish, the more uniform the flan will cook. When you use a larger dish – sometimes the outsides overcook while the center isn’t yet done. You can try using one full recipe to make a 9″ flan… but I’m not sure how long it will take to make, you might have to experiment on that. Spectacular recipe and methodical explanations. Yours was the best online recipe by a long shot. My husband loves creme caramel and it is one of the select few desserts he enjoys and eats. So… Having never made it before, I tried your recipe in a 10inch glass pie dish and it was a dream…! My fussy husband said it’s the best he’s ever had. My toddler had three bowlfuls. I have personally never liked creme caramel because it always left an odd soapy taste/residue on my upper palate on the rare occasion that I tried it (overcooked egg possibly?) but THIS was a revelation and a wonderful surprise. I think the techniques that you have laboriously come up with after much experimentation helped a flan novice like me. Kudos! b) I baked for about 45 mins. (My oven takes longer for everything) but I made sure the centre was wobbly and jiggly. c) I used whole milk. There is going to be a lot of creme caramel coming out of my happy kitchen! its easier if you put your ramekins in the oven while it is preheating and then pour the caramel into them while they are piping hot. gives you a few extra seconds before the caramel cools down and sets. In answer to Harmony’s question about chocoflan. YES, this recipe does work with cake and you don’t have to make them separately. Follow all of the directions for this flan recipe but after you caramelize the sugar, add your cake batter FOLLOWED by the flan mixture. Through some kind of magic the flan ends up at the bottom so that when it’s inverted it ends up at the top and is beautiful and delicious! Can I add cacao powder? What will be the amount? Do I have to increase any of the ingredients? I have never added cocoa powder, so I can’t really tell you exactly how much – you may need to experiment. I’m thinking you could probably start with about 1-2 T. unsweetened cocoa powder without adjusting any of the other ingredients. Wonderful recipe – and so easy! Thank you for sharing. The longer you cook your caramel, the dark it will be. As soon as your caramel is almost at the color you want, remove it from the heat and immediately pour it into the ramekins. The longer you keep it in the pan (which is hot), the darker it will turn. Thanks for posting this recipe with all of the detailed notes, which I’ve been keeping mind. On the same day I tried two recipes–the one you posted here as well as the one here http://www.ricardocuisine.com/recipes/633-creme-caramel . I brought both batches to a family gathering and asked my sisters (who are Argentine “flan” enthusiasts) to compare them. Interestingly, they couldn’t tell there was much difference, except yours was slightly creamier. The second recipe is somewhat more complicated because it requires heating the milk (then careful incorporation into the eggs) and also boiling the water for the bain marie, so I thought it was interesting that in the end, the extra trouble didn’t seem to greatly affect the final result. A modification I had to make: For your recipe, I did have to bake the cups for much longer than 30 minutes, and I also ended up turning up the heat to 360, since the mixture was still quite watery (not jiggly) after half an hour. Perhaps the thick dish towels and the not-really-hot water I used were factors there. Thanks again for sharing this recipe and the detailed notes. I’m sure I’ll use this recipe again. Hi! How can I prevent the eggy taste? Have you tried my recipe? I don’t think it tastes very “eggy”. The worst thing you can do though, is over-cook the flan. If you over cook it, it won’t taste as good. If you don’t like the taste of eggs though, you might want to pick a different dessert that isn’t quite so egg based. I’m a little inexperience when it comes to caramel, so I must ask: is there any difference in making caramel out of pure sugar, and making it with water? Love your recipe by the way. I don’t typically make caramel just with sugar – I find it is a bit quicker to burn. I think it’s a bit easier to control the caramelization process with a “wet” method. But would it change the end result? What do you mean, you mean if you make the caramel without the water? Yes, it might be a bit harder, and probably more dark, and maybe slightly harder to pour over the bottom of the ramekins. The way that I make flan is in the steps above, as the recipe above describes. If you want to try making dry caramel – then go for it. It’s your flan, and there is no right or wrong way – both dry and wet methods have their pros and cons. But this is how I make it. I used this recipe the other day for a Chocoflan cake. It was absolutely perfect! Smooth, beautiful, and so delicious! When making the carmel topping, make sure you start with a hot pot. Mine was too cold and I thought I had ruined it . I tossed out two batches before finally getting it got enough to realize I hadn’t ruined the first two, I just hadn’t waited long enough. I used a bundt pan. I still used the hot tap water Bain-marie and the kitchen towel. No cover over the cake, it turned out perfect (just had to cook longer). Follow the instructions! This is so beautifully laid out, with such a clear walk through, that it is a shame if you don’t use it! If you do follow directions, it will be perfect! Fantastic instructions for your flan! Very detailed and extremely easy to follow. Thanks for adding the pictures. My oven is gas and it always takes much longer to cook/bake and your recipe for the carmel was what I was really after. You have a great recipe and I’ll try it on another occasion. In the past, I have had trouble with the caramel turning like a rock in the ramekin. Will I have to put my ramekins in hot water to release the caramel from the bottom of the ramekin? I am serving them at a dinner party tonight! I don’t think so? Usually once the flan has been chilled, and good portion of caramel is on the flan… I haven’t needed to use hot water to release. you don’t said what size eggs , large, medium or extra large? I normally use the eggs from Costco, which are extra large. No, I haven’t tried silicone molds… but I think that would probably work if you want to give it a try. This is soo helpful. I find that when i make a cheese flan, i soften my cream cheese in the microwave and then add to my eggs to mix, it congeals. Very frustrating! What i am realizing is that my eggs are cold and then the cream cheese is hot, this is my problem! So my question, room temperature for eggs and the cream cheese, how long can i keep those unrefrigerated AND should i use a mixer on low or use hand method of mixing? I use a sieve and literally 80% of the mixture is left in there than in my pitcher. How can i “liquify” it again making it creamy instead of just throwing it away? Seriously, you have been such a help! Can’t wait to try your flan! When I make cheesecake, I will often leave eggs and cream cheese out overnight… so I think you would be safe for up to 8 hours if you live in a temperate climate. The recipe that I posted above does not contain cream cheese – I think the cream cheese is what is clogging up your sieve – I don’t really have any useful suggestions for you since I don’t make my flan that way – maybe try a coarser sieve with larger holes? Try my recipe without cream cheese and see what you think. 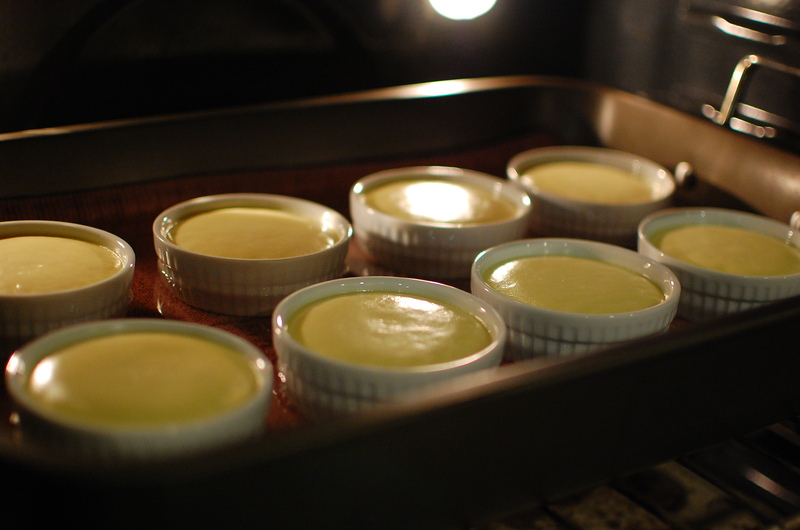 From step 10 (above): Then, cover each ramekin with plastic wrap and refrigerate at least 4 hours (or overnight). I followed your recipe and methods to a T and it was perfect. I’ve tried many recipes but yours is the best. Thank you!!! What is the serving size for this recipe? Thanks! It makes eight 6oz. individual flans. Are you sure you are using 6oz ramekins? I Used that same size twice and I didn’t have enough custard to pour on all eight. Also, mine took almost two hours to bake, maybe because I was only able to fill 6 ramekins. In the picture your ramekins look smaller than mine. Please let me know what size you are using exactly? I measure the custard and it was about 4 cups so I don’t think you were using 6oz ramekins. I did the math and it just doesn’t add up. Please help me! The ramekins I used hold exactly 3/4 c. of liquid if you fill it up to the brim. When I make the flan, I don’t fill the custard up to the top – I fill them maybe about half way to leave room for expansion (they tend to swell a bit when baking, and I don’t want anything to overflow). I tried to make caramel pudding for about 5 people using a rectangular cake pan. I used a water bath in an aluminium tray and placed the pan inside.I baked it for about 30 minutes at 375 F. But the top layer of the pudding started turning brown right after 15 minutes. Even though the pudding was still very much undercooked. So I could not take out the pudding for another 15 minutes. Can you please tell me how to avoid the browning of the top layer. I just want it cooked, and not turn brown. I am planning to again make the pudding in the next 3 days. Please help me with where I am going wrong. Thanks a ton. Hi there. What happened to your flan is exactly why I don’t like to bake flan in a large dish… I think they turn out much better (and it’s easier to control the cooking process) if you make smaller individual flans. So try using smaller round ramekins instead of a large rectangle pan. (The other thing to keep in mind is that with a rectangle shape, your corners will cook much faster than the other parts.) If you really really really want to make a large one… I’m not sure what to tell you. Is the heating element of your oven on the top or the bottom? If you have an upper heating element, or if your heat is up too high (keep in mind the temperatures I post are in Fahrenheit, not Celsius), it will most likely “toast” the top… When I make flan, the way described in the recipe above, the custard does not brown. I like to add a can of pumpkin, a little clove, cinnamon, ginger, and cardamom — this require adding 2 more eggs. Hi Mika. May I ask if you use a whole eggs or you separate the egg yolk and egg white. Thank you!! I use whole eggs, unseparated. Your recipe is incredible and the instructions are great. Thank you! This was my first attempt at flan, and definitely not my last. I made them last night and tested one this morning. They turned out beautiful and taste wonderful! I have one inquiry for you. When I strained the mixture through the sieve, approx. 1.5-2 T of egg white was remaining in the sieve. It wasn’t chalaza. My best guess is that it was the thicker of the albumen/egg white. At first, I tried pushing it through but to no avail and didn’t want to agitate the mixture, so I chose to discard this remaining amount. It’s possible my sieve is extremely fine, or maybe I should try stirring the mixture a bit more before straining. I’m curious if this is typically what you see and if not, is there something I could try to do differently? Hi there! I haven’t had that happen to me… but with 4 eggs in the mixture, missing a small amount shouldn’t affect the outcome too much. How did it turn out? If your flan didn’t turn out, then next time try a slightly coarser sieve. Why i didnt read your blog before i tried cooking this flan.. i tried the other recipe.. how frustrating! Anyhow, the oven should be set on bottom heat only? Is electric oven will do? Hi there. My oven is electric, and when set to the “bake” setting, heat only comes from the bottom – however it does have convection (fan blows the hot air around the oven). If you have the option to do bottom heat only, that’s what I would do. If you have an additional top heating element, it will most likely cook quicker, and the tops will be browned/toasted. Hi! What’s the problem if leche flan is too soft? It’s kinda watery. Are you talking about this recipe for flan? If it’s too soft, you may need to cook it a few minutes longer next time. Just made this last night. LOVED IT! It was my 1st time making flan, but I’ve always loved the taste. I, too, had a flan that was so smooth and silky at a Cuban restaurant in NYC. This recipe is the closest to it by far! Thanks so much! can i use my yogurt maker to made this , but for longer period of time may be 3 hours or so ? I don’t know? Are you using my recipe above, or are you using a different recipe/technique? I would guess if it has cracks in the middle, it might be overcooked. Love the website. Whenever I make flan, when I unmold it, there are always bits and pieces of custard. Why is this? In your picture, I don’t see any bits and pieces! Did you use my recipe and technique? I’ve never had the flan stick or had any “bits and pieces” using my method. Hi- great tips! I’ve been making this for 40 yrs+. I almost always use undiluted evaporated milk instead of half-and-half, although I’ve made it almost exactly like this recipe also. Condensed milk can definitely be used as part of the liquid and for most of the sugar- I’ve done this before too. When it is used, the flan has a much denser texture, which is how it is usually made in Latin America and in Spain. Also, I prefer a custard that isn’t overly sweet, so I taste as I add sugar. And probably because of my French heritage, I always dust the top with nutmeg. Flan/custard just seems to be missing something to me without it! So, I have to make flan for 30+ people. Is there a way to make one bulk flan, or would I need to make several? I’ve never made it before. I normally do not like to make 1 large flan because it is more prone to failure – the sides cook much faster than the center. Hi! I tried your technique, but cut the recipe in half. Both times, the flan was still watery. What am I doing wrong? I also cook it for 30 mins! I’m not sure. Did you allow the flan to continue resting in the water bath after cooking or did you remove immediately? It needs to continue sitting in the hot water after removing from the oven to continue cooking. Also, make sure that you are not using really large ramekins or overloading each ramekin – too much custard will take much longer to cook. Hi Mika, I did experiment leche flan twice already & the result was..
At first I tried it with the with egg yolks & the 2nd time whole eggs. The first time I think it tasted good but really really sweet as I did not use the much the evaporated milk.. The 2nd time, I did use it, but then the taste was not that sweet but quite reached still. Do you know how to make it not so reached? Or what is the secret? Interesting, when I did this recipe for the first time, the sides of the flan came out with a somewhat bubbled” appearance indicating it was overcooked, and yet the interior of the flan was perfect – the picky eaters in my household all gave it thumbs up. I’m wondering just what went wrong; was it overcooked just slightly, could the water bath have been too low, or was there another problem I missed? I’m not sure. The cooking times I suggested are guidelines, but you want to err on the side of undercooking. The flan will look quite jiggly when you remove it from the oven, and it will continue to cook itself with the carry over heat. If you had bubbles on the side… you might want to decrease the cooking time next time. Also make sure you don’t overly agitate the mixture. I have to wonder if overly agitating the custard was the culprit; I beat the sugar and eggs together pretty hard, the milk much more gently (and heated), and strained, but some bubbles still may have found their way into the flan. I’m definitely decreasing the cooking time; the flan came out very jiggly in the center, but solid around the edges. Probably overcooked just a bit. Flan is a delicate recipe, but really no more so then the cookies I often bake; just have to keep trying. THe only other thing I can think of is if you used a large dish instead of several small ramekins? I always suggest cooking in small ramekins because one large flan will have a tendency to overcook on the outsides by the time the center is just done. Nope, actually used ramekins for that very reason. Well then I’m not sure! Maybe try lowering the baking temperature… some ovens run hotter than others. Hello! thanks for this wonderful recipe, is the temperature of the oven 325F or 325C? As a real life Latina I can honestly say this is not how you make flan. Why do white Americans insist on changing and complicating things? I’m Japanese Austrian, by the way. Well you typically preheat the oven to the degrees you plan to bake at… that way the oven is already at the correct temperature when you insert your pan. So for this recipe, you preheat the oven to 325, then, you bake at 325. So no, you don’t need to change the temperature. Just keep it at 325 degrees. (Fahrenheit). Can i use mason jars instead of ramikins? Probably? I’ve never tried it, but I don’t see why not? For 40-1hr of cooking my flan in low fire, then why it stil soft ? I don’t know. Did you change anything? Keep in mind that my suggested cooking time was for EIGHT 3.5 inch diameter ramekins. 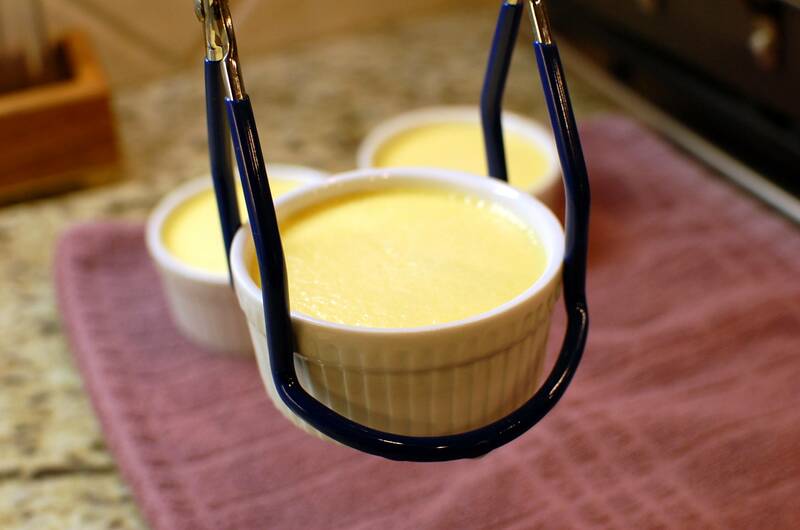 If you used a different sized ramekin, or divided your custard into fewer than eight ramekins… then this recipe will not work for you as written. Also, I did specify the exact temperature of 325 degrees. (Fahrenheit) So I’m not sure what you mean by cooking “in low fire”… but your temperature may not be correct. Did you use HOT tap water for the bain-marie? Do keep in mind that the flan should be a little bit soft and jiggly in the center when removing from the oven. The flan will continue to cook from carry-over heat as instructed in step 9. Every time I try it, after overnight refrigeration, flipping it upside down,the Carmel is always rock hard. (Have used lemon while caramelizing). Everything is perfect other than the hard caramel in the end…. I don’t know what to do..very frustrating..!! You might be overcooking it… maybe try a lower heat, and a short cooking time. I want to include the towel technique into my flan. I already strain the eggs before I add the rest of the ingredients but since I use sweet milk instead of sugar I am not sure if it is a good idea to strain it at the end. I will be sure to mix the ingredients gently though to avoid air bubbles. I also like to make coconut flan which would make it impossible to strain at the end or it will lost all the coconut, lol. Thanks for the tips, they are very useful. hello. thanks for the wonderful way of making custard flan. . i just have questions. is it ok to use steamer instead of oven. and llanera instead of ramekins? thank you very much in advance. You can try it? I don’t make it that way normally, so you may have to experiment a bit to see if it works out. Hi I cooked and sold leche flan and according to the buyer it is delicious like it melts in the mouth. My problem is that its too soft. Can you give me an advise on how I can make my leche flan firmer. I’m not sure. Are you using my recipe? You can try decreasing the liquid to see if that gives you the texture you desire… you may have to experiment though. Hi actually I have my own recpie I just ask if u have some secret ingredient to make a leche flan firmer. Hi, I was trying to make the flan, but I realized I dont have half and half. Can I use evaporated milk instead? No, you won’t get the right texture. But you can probably do half evaporated milk, half cream if that helps? I just tried your recipe..perfect.love it and my husband thinks its the best that we had. I just have difficukty in getting it out from the ramekin..any other tips aside from using the kni for the sides? Thanks..
You can try warming the sides a little bit by setting the ramekin halfway in some hot tap water. Other than that, I always use a knife and it comes out fine. Why you put the caramel only on the bottom of the ramekins and not the sides? My mom used to put caramel on the sides too. You can try doing that if you want to, but if you use my recipe you probably won’t have enough caramel to do that. OK… so let me understand…. you didn’t follow my instructions and now you have holes in the sides? I don’t steam the flan. I bake it in a water bath. Maybe try the method I outlined in the post and see if that works out better for you. Steaming is probably creating a too hot cooking environment making the custard bubble – then those bubbles are setting along the sides. Using a water bath in the oven is a more gentle and slow cooking method that will help you avoid those “holes” or bubbles. You repeatedly tell people to follow your recipe “EXACTLY” as you have listed, but unfortunately your recipe is not “EXACT”. There is a big difference between medium, large, and extra large eggs and each will result in a different proportion of egg to half & half ratio. So you might want to correct that in your ingredients if you really want people to get comparable results. And do keep in mind that not everyone will get the “EXACT” results as you since the type of oven and type of bakeware will vary from person to person and they will need to make adjustments accordingly. Most of the time when I’m telling people to follow my recipe as written, it’s because they are having issues from substituting one major ingredient for another… or attempting to make a major change in ingredients or technique then wonder why things don’t work. It’s fairly standard here in the USA that most recipes are written for large or extra large eggs… most grocery store and large bulk warehouse stores mainly sell extra-large eggs. That’s what most people use. You will also find that pretty much 99.999999% of recipes and books will not tell you the size of the egg because of the assumption that you are using the same eggs that everyone else is. If you are using small or medium sized eggs… well, then you should consider that many recipes that you might use that are egg-heavy or dependent on eggs for thickening or leavening will fail… so you might want to adjust your egg proportions on your own if you are not using standard eggs. I’m sorry if you had a problem with my recipe. Please feel free to not use any of my recipes that I provide for FREE for educational purposes to anyone who wants to browse. Looks awesome and well explained. I usually make Coconut Flan and it comes out beautiful. but never knew how to make just regular flan…. I am not a baker… Great recipe , I will try it. Hi there! I read pretty much all of the responses… I try to help where I can. But I have learned over the years that you can’t make everyone happy! If i want to bake this is a small corningware baking dish – how long should it be in the oven for? I made my flan in a deep dish (similar to Corningware), 9 inch. I cooked it for 1 hr and 15 minutes. However, it depends on the size and depth. You will have to bake for at least 50 minutes. Just make sure the consistency resembles jello and not cake batter (undercooked). I hope this helps. Thank you a million times. My flan came out perfect and is beautiful. I’m so proud and I have you to thank. I didn’t use your recipe but used your technique and it worked wonders. I used 2 cans of condensed milk, 2 can evaporated milk, 5 eggs and 3 egg yolks, vanilla extract and a dash of nutmeg. I used a very deep 9 inch dish and had a little leftover. It took 1 hour and 10 minutes until it was a jello consistency. It came of out so creamy and smooth. It tasted amazing, shortly after refrigerating. No bubbles and burned sugar. You’re a lifesaver. Keep posting! Thanks! My recipe is obviously not the only way, but the technique mentioned above should help you with any flan (or custard) recipe. Why is my flan won’t get thick. It’s like running water. I’ve been steaming it for 1 hour already. I’m not sure why your flan won’t thicken…. I do notice you say you have been “steaming” it. My recipe does not call for steaming as the method of cooking, but rather baking at a controlled temperature. Maybe try baking in the oven as described above instead and see how it works out for you? Thank you for the instructions! I will be trying it for my first flan experience as soon as I can get me some ramekins. One question, I’ve read in one of the comments-responses here that I should use only the bottom heating in the oven, if possible. Should I still put the rack into the middle, height-wise? Yes, I think the middle of the oven would probably give the most even heating. Instead of ramekins, I would like to use a round mold. Would you recommend that? What size do you think would be most effective? I think smaller ramekins are most effective. The larger the baking dish, the higher the risk you run that your flan will be overcooked on the edges before the center is actually set. Hi! I’ve been making flan for decades now, and always have fought with the bubbles on the sides. Usually I make a large flan (pie-plate sized), and cut it into triangles to serve. I’ve tried warming the milk first, starting with cool water/warm water/hot water in the water bath … so many things, and could never get rid of the bubbles. However, it was only cosmetic, because my flans are always smooth and delicate and wonderfully “jiggly” as you call it….but with a heavy skin on the top(bottom when you flip it) and lots of little bubbles on the sides. I sometimes make it in ramekins, but usually I’m cooking for a large group, and it’s cumbersome to set up 16-24 ramekins, so I’ve been too lazy. Anyway, I’m anxious to see how this recipe turns out — I was very careful with the stirring, and when I strained the flan (which I always have done, just to get rid of the egg white glops), I made sure to strain it down the side of the measuring cup so that I didn’t create more bubbles while straining. It was smooth and beautiful going into the ramekins. I have high hopes!! I have never added water to the sugar that I caramelize and it works just fine — I agree that you have to watch it like a hawk, and that the longer you let the flan chill in the fridge, the more “sauce” you get, and the less hardened sugar is left behind in the ramekin. Well, it was good and bad. I was so concerned about over cooking the flan, that I undercooked it. It was a yummy pudding, with a very smooth texture, but I won’t know if it really works until I try it again. I need to trust my instincts about when it is done, but I have found in the past that the time varies widely, which I think has to do with the freshness of the eggs. I’ll try again soon. Hello, Your recipe sounds great and I’m going to try it next weekend. I like my flan with LOTS of caramel sauce, which is slightly thick (as opposed to some of the more watery sauces I’ve had). Can you tell me if your recipe provides the slightly thicker sauce and in large quantity? Would I just simply pour in more of the sugar liquid into each ramekin? Hi there. You may want to double the caramel recipe to achieve the results you want. Hi….I tried making Flan the “Latin” way as they say, with condensed milk, evaporated milk, etc. Turned out awful. I also used a blender, since I was told to use one, and that caused lots of bubbles, terrible! I’m glad I found your post and I will try this recipe tonight. One question: Can you make this recipe in a larger container, like a bundt cake pan or something similar instead of individual ramekins? Hi there. Well, yes, you could… you can do anything you want (and some people have done so successfully)! But for me, I don’t like to do that… because with larger pans, you run into the problem of the outer edges cooking faster than the center. So you can try it that way if you want… but I don’t like to do it that way. hi for the half & half…can i use condensed cream & evaporated milk instead..
Hi there. I’m not sure what condensed cream is? (Here we have “condensed milk” which is a very sweet product…) If the condensed cream is a non-sweet higher fat dairy product, that plus evaporated milk should be ok.
Greetings from Brazil! First of all, thank you so much for taking the time to put up this recipe in such great detail. I was wondering if you know the internal temperature of the flans when they are ready. I know you say to bake in small ramekins for better results, however down here flans are traditionally baked in bundt pans, and I wanted to maintain the tradition when I make it for our family BBQ tomorrow. Thank you! I’m sorry I don’t know! Hope you had a great BBQ! I’m getting ready to make this for the second time this weekend. The recipe and detailed instructions/technique you laid out was a labor of love for sure. My husband and I have eaten one too many lumpy, thick, eggy flans in my time, but your recipe was none of those things. Gloriously light, creamy, smooth, gorgeous when served, yours knocked all the others out of the park! Thank you!!! Thank you for your feedback! I’m glad it worked out for you! The creme caramel tasted fantastic. One problem, the ramekins cracked below the hardened caramel. I did use a water bath and baked at 350 for anout 40 minutes until a knife came out clean. The last time I baked a flan in a round glass dish, it also cracked under the caramel. Sorry I’m not understanding what exactly cracked? Are you saying the dish/ramekin itself cracked? If so, and this happens to you a lot… there maybe something about the temperature of your oven. Are you insulating the bottom of the dish with a towel? Most helpful. Even the fact that you left in and dealt with one particular negative comment. The points about the egg chalaza regarding straining the mixture, the gentle stirring with a whisk, rather than the beating I gave the mix with a hand mixer (re the bubbles problem), the non darkening of the caramel for it to be less bitter, and also putting of a tablespoon of water in the sugar for the caramel (I used to do it with no water), all have been so very helpful that my flans have gone from just below excellent straight to astounding! Thank you and thank you for sharing! Hi there. Typically custards are not supposed to separate and curdle. If you have curds in your custard, it means something has overcooked (or you’ve added acid)… or you have precipitated out your solids. Even in America! enough, or if I needed to add another egg. What do you think? Hi There! I’m not sure. As far as I know, there is no standard “hardness” for a custard… I do like it more soft and creamy. If you prefer a firmer flan, then you could try to add another egg (or use slightly less half and half) and see if that does the trick. Thank you for the Caramel Custard receipe. I will be trying it tomorrow. When you mention pre-heat, how long does one pre-heat an oven? please let me know. I would preheat your oven for at least 15 minutes. My oven has a pre-heat setting, and the oven lets you know when it is ready and at temperature. I love your recipe. I used to make flan but it always came like custard with bubble all over. Nowadays I follow your exact recipe. I am making for the 5th time today, and happy to say that every time it come out smooth and delicious. Thank you for posting techniques to it right. I really appreciated the step by step instructions in your recipe–thanks! I love this recipe. Your detailed and clear instructions and the proportions of egg cream sugar and vanilla are spot-on and it has become a fast favorite in my house. Tonight, I am serving this for a late dessert for a birthday party (on request). However, I have 4 hours to cook and cool and chill before I need to serve. Do you suspect it will be sufficiently set? Would it likely ruin the flan to chill it for an hour in the middle in the freezer? Or for 30 minutes? I suspect you won’t get back in time but on the off chance you do, I thought I would ask. I’ll be sure to update with results for your edification! Sorry, I am quite late in replying. Did it turn out in time? *Mika, sorry. I even corrected it but autocorrect is in control of my phone, I guess. I’m not sure what this is but this isn’t flan. I understand that there’s different ways of making stuff but this is just a completely different recipe. Maybe you should change the name of it. This is another just another “Americanized” knockoff recipe. Authentic flan consist of sweetened condensed milk. Thanks for your opinion. There are many ways to make flan, and as a reminder… in the olden days (aka the middle ages) sweetened condensed milk didn’t exist! but the taste made up for the shortage…. size didnt matter here…..? I justed wanted to thank you again for sharing such a great recipe…… P.S. I came across my grandma’s recipe box from the 1880s amazing… her tadol recipe nothing comes close to hers they are so good I was asked to cater the dessert table at my cousins wedding… little secrets can really make a recipe go from good to great… never knew when rolling cookie dough in your hands never use your fingers only your palms…what a amazing difference.. thank you for reading my endless review…. I appreciate you breaking this recipe down to the essence. Thank you. Do you have other recipes? I made a substitute for half-n-half & it worked perfectly. Those who don’t have Access to half-n-half just boil 5 cups of milk & reduce it to 3 cup and also don’t forget to put butter to make it extra creamy. Also I made my flan in a cake tray(oval) as I didn’t had ramekins, just had to cook for extra 20 minutes. Other than that I followed the recipe to the point & my family loved it! Though according to the recipe it was little bit sweeter for us(as we don’t like much sweet) so next time will adjust that. Happy baking lovelies!! Sorry for the late reply. How did it turn out? I would think a little bit of water would be ok… but too much would make the custard runny. I have tried it and it was perfect. so I had to make the cream by Combining 1 cup of milk less two tablespoons with 2 tablespoons melted butter . then I mixed 1/2 cup of whole milk+ 1/2 cup of cream and the result was butter on the top of the milk which is totally different than the half and half i buy from the grocery! however, I used them to make your recipe. and the result was butter on the top of the batter and even after i got them off the oven there was a lot of butter on the top!! i will let it refrigerate overnight. I am pretty sure it’s not gonna be as it should be!! Do u think that i shouldn’t use that homemade half and half for baking?? Hi there. Sorry, *butter* + milk is not going to work very well in this recipe as a substitute. You can do *heavy cream* + milk as a half and half substitute. I followed your recipe exactly; however, I had to make 2 batches of the caramel to fill the 8 ramekins (same size as the ones you use). When I was cooking it at low heat I was getting a lot of crystallized sugar on the edges of the pan, therefore wasting the sugar I would guess. And I had to cook the sugar/water mixture more like 10 or 15 minutes before it got brownish. Do you keep your heat at medium-high the entire time? You have go low and slow, so I thought I needed to turn down the temp. Have you ever tried adding a little of invert sweetener, like honey or karo syrup? I’ve been seeing and reading a lot of recipes lately that say to do this to prevent sugar crystallization. Also, your website says “350 degrees” but this recipe is 325 degrees, is this correct? I used a ceramic Corning ware type baking pan and not a metal pan and I had to bake the ramekins for at least 10 or 15 minutes longer before they were not liquid and more jiggly. Should I have used a metal pan instead? My website name has nothing to do with the temperature on this particular recipe… so yes, 325 is correct for the baking temperature. Yes, I use medium high heat to make the caramel, not low heat as you tried. Ceramic or glass pans will not conduct heat as well as metal, so I can understand why it may have taken you longer to bake. Adjust accordingly if you are using glass/ceramic pan for the water bath. Another use for the caramel remaining at the bottom of the ramekins is to add a small amount, teaspoon or so to the bottom. Put in microwave on high for 20-30 secs. Stir. Put back in for the same amount of time, watching that it doesn’t start to boil over, being ready to open the microwave if it does. Stir. Keep doing this for less time, like 15-20 secs until the hard caramel releases from the bottom. Then put in microwave and put the Power setting at 2 for 1-2 minutes. This way it won’t boil over but keep it heating. Stir and do it again. You will get a thick creamy caramel sauce you can use or just eat! How about splitting a banana, frying it in a litter butter and topping it with the caramel sauce? Thank you so much for your step by step instructions and tips!! You are awesome!! Some neat tips here, but I wouldn’t call this flan. This is just a custard. 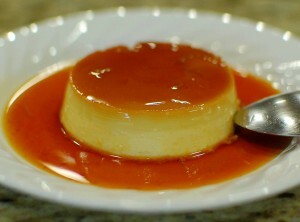 A flan uses evaporated milk, and sweet and condensed milk. They had evaporated milk and sweetened condensed milk back in the middle ages when flan originated, right? There are many ways to make flan. This is one way. You, perhaps, have a different favorite recipe which includes (more recently invented) convenience products. That’s flan too… but not the only flan! I tried this recipe to make something for my Spanish teacher and she loved it! This was an excellent recipe and my custard turned out perfectly smooth! I used to not like flan until I tried this recipe. Thank you so much for sharing! Thank you for the recipe! It is wonderful. One of my favorite recipes!! Hey quick question I make my flan at 2 am and I put the flan at 3 am and flan baked only for 50 mins I put flan into the frigde when I woke up I saw the flan it’s still watery can I put flan into the oven again? Probably – but I’m not sure. Please, is it possible to use Pomegranate molasses instead of the syrup and how I can used it? What do you mean by abbreviation c.? Hi there. I think you can try using the molasses and see how it turns out. The abbreviation “c.” stands for the American volumetric measurement of “cup”. 1 cup = 237mL, by volume. Just made this yesterday. Turned out very good. However, I had to bake mine for 15 minutes longer. Maybe because I live at a high elevation? Anyway I am very picky about flan. This was very smooth and creamy, I might try it with one more egg though. Some of the comments on here are rude. Just because one’s ethnicity may be Latin does not necessarily make one an expert on making flan. Both the best and the worst flan I have ever eaten were both made by Latinas. One was smooth creamy delicious and perfect, the other overcooked, spongy grainy and too eggy. Just sayin’. Hello! Very true. I take rude comments with a grain of salt… if the worst thing in your life is someone else’s flan recipe on the internet… then… lol. If you like a firmer texture, you can certainly add an extra egg or two. I think that the higher your elevation you do need to adjust the oven temperature hotter (25 degrees F hotter for every 5,000ft). Hi! I tried to follow your recipe but I ended up having an under-cooked flan. I inserted it again in the oven for another 20 minutes but still when I turned it over after refrigeration, the inside of the flan is still liquid. I used a borosilicate glass (as replacement for the roasting pan) and I used the convection option in my oven. Should I have turned off the convection option instead and use a roasting pan? Glass does not conduct heat the way metal does, so that could have altered your cooking time. Make sure you are filling the water bath with hot water. I don’t think the convection setting would make a difference. I am spanish from Spain, where we don’t eat chillies, my mom made flan, bread pudding (flan with bread), never used condensed milk…. she never used anything out of a tin, I still use all her recipes. As far as the caramel, i poured it into my ramekins but found that by the time i got to the last ramekin and went back to evenly distribute the caramel, it was solid. So some of my dishes just had a solid set of caramel in the middle. What can i do?? While you are pouring the caramel in, it is hardening so you want to rotate the ramekin as you pour it in so that you evenly coat the bottom. To give yourself more time, you can preheat the ramekins and that may help some. Hi, Mika, I found your site by accident yesterday. Your instruction is so well instructed & detailed, therefore I wanted to give a try. Yesterday, I read your instruction twice before cooking it. It was my first flan in my life. It came out not perfect but acceptable for the first timer. I thank you for your time spent on written the recipe. Now I want to follow all your recipes. How do I do that? For the flan part, the caramel is excellent. For the custard part, the custard is too soft to stand on its own once removed from its remekin. May I ask the reason why? The texture is very smooth though. When I mixed all custard ingredients, did I need beating the eggs to loosen them up first before adding into other ingredients? Since I didn’t want to create air bubbles in the mixture, therefore I did not do so. Was I correct? Pls advise. I am going to try it again once I get your instruction. Hi there. No, you do not need to overly beat the eggs. If you like your flan to have a firmer texture, you could add an extra egg or two. Nice try, but this is American custard with caramel. I have a cookbook I inherited from 1700’s Spain from 7 generations back and real flan uses 3 cups of whole cow’s milk…never in my long life, and I’m of Spanish descent, has any of my ancestors or me used 1/2 and 1/2. Your egg count is also off. By the way, you can make the flan mixture in a blender, strain it and once poured in a preferably round pan, you can’t just tap it against your counter a few times to get rid of bubbles before baking just like you would do a cake batter. Sorry to say that your picture looks like the stove top made flan on the highly marketed Goya box. Yikes. Lucky me that you read my blog and corrected me and everyone here on how to do things the only one way allowed!!! I have said before, many times, that there are many ways to make something (including flan). Your recipe that you use may be a great one – but it is not the only one, and not the only way. Sorry to say that your comment sounds like a sanctimonious internet troll wrote it. Have a GREAT DAY! How long do you recommend baking if I use a 9 inch round pan? I don’t like to use a large pan because I feel it overcooks the edges. You may have to experiment to see how long it will take.